Mindfulness is something of a buzzword these days. When concepts, words or disciplines become buzzwords they can lose their true meaning and power. Mindfulness is paying attention from moment to moment with a nonjudgmental awareness. When you are practicing mindfulness you do not judge the present moment, you experience it. When you are living mindfully, each moment of life as it is experienced just as it is unfolding in the here and the now. The ability to stay present invites you to experience your life in a meaningful way, where you are not simply responding to past experiences and stress or future worries. Engaging with the present moment is experiencing what is true right now. When you are able to experience what is true right now you are able to acknowledge, feel and accept your emotions. The act of being mindful—of being completely engaged in the present moment—offers the opportunity to no longer act or respond to life out of your unconscious mental and emotional programming. When you step away from acting out of autopilot mode, you can begin to make conscious choices about how to live your life right now. When you are able to both be aware of your emotions and make a conscious choice, emotional eating becomes less overbearing and more within your conscious control. While mindfulness may seem like a simple concept, it is definitely not an easy practice. 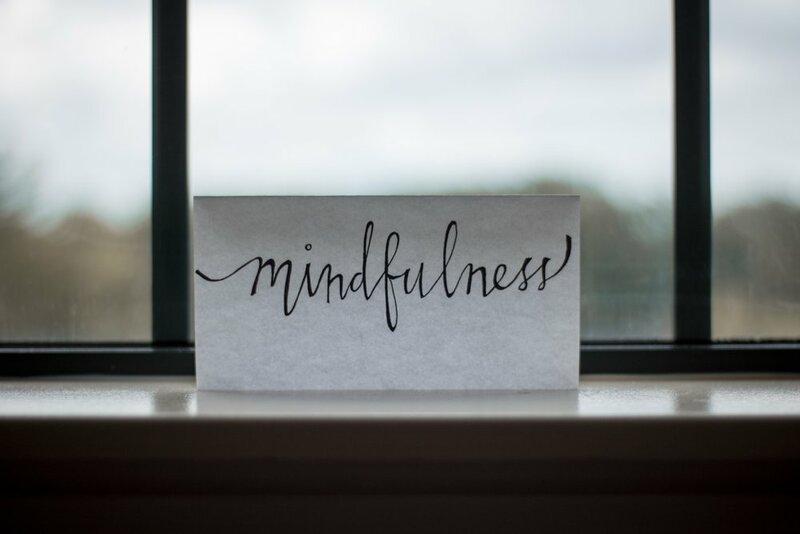 While there are helpful apps, classes and books you can use to learn and practice mindfulness, having quiet time to be present and reflect on your experience of the present moment is where your power lies. The power is in the practice, not it in the learning about and studying the practice itself. When you can experience your rich internal emotional world without hesitation or attempt to flee from any emotional distress or discomfort, your self-awareness grows. Through a consistent mindfulness practice, your ability to make a choice in the present moment is enhanced. When you practice mindfulness in a disciplined manner, over time, you free yourself from the binds of emotional eating. While this progression may sound simple, or too good to be true, remember that it requires these two elements that allow it to be integrated, over time, into your life: dedication and self-discipline. When you bring the element of dedication to the practice of mindfulness you can offer yourself time daily to pause, reflect and release any emotions that are triggering your emotional eating. (You can read more about creating this personalized plan from a previous blog on this process here.) The importance of self-discipline is all about showing up for the practice, showing up for yourself and your emotions for the long-term. When you are fully conscious of your emotions, they become less uncomfortable and more of a message about your experience of your life. When you are more deeply connected to your internal emotional world, you can respond in an empowered way to your emotions and therefore not run from them, not attempt to escape them with food—or anything else that only serves to numb out your emotions. To establish a mindfulness practice, it is best to start with one minute and then build from there. One minute of attempting to witness your emotions, thoughts, body sensations and external environment can feel like a really long time when you first begin the practice! After two to five days, increase to two minutes. Over time you may find that ten minutes feels really great! I recommend spending some time in reflection following the practice whether through journaling or simply acknowledging what the experience was like for you. I also recommend logging the minutes and making some simple notes about how you felt before and after the practice and any emotions or thoughts that arose, just to notice, not to judge. As you apply this practice to food, eating, and further into your life, you will see how showing up for yourself in this way is empowering and freeing. You will see how allowing yourself to experience your emotions offers you valuable and deeply meaningful information about your experience of your life. Being mindful and emotionally aware allows you to make a choice about how to respond. Over time, food becomes less of a coping tool and more of a space where you can derive nourishment and pleasure. When you begin to integrate a consistent mindfulness practice into your life you open the opportunity to truly make peace with food. Do you love yourself? Do you feel as though you are enough, just as you are, right now in this moment? Do accept yourself unconditionally? Here’s the radical, complete and honest truth, you are lovable, you are enough, just as you are right in this very moment. Not because I say so but because you are alive, you are here and it is your birthright to feel whole, to feel as though you are enough. It is your birthright to love yourself unconditionally. While this might sound really nice to love and accept yourself without condition, self-love can be a missing element and hard to come by for so many. Some view self-love as a negative, ego-driven problem. Others of you may view self-love as a challenge. If that’s you, is it because you put your love out into the world and into others and don’t reserve any for yourself? Self-love is important, it is vital to living a fulfilling, peaceful life. Self-love is more about how you view, value and treat yourself internally and externally. The good news is that self-love can be created, grown and developed with consistent practice. First, let’s address the faulty belief that self-love is a negative, ego-driven problem. While it can be easy to label others as selfish if it seems that they are only considering their problems or needs when they make choices in their lives, that does not necessarily mean that they actually love themselves. The ego can be dangerous and overbearing. When you are living from a space solely based of the needs of your ego, it will cause problems in relationships and interpersonal interactions. However, someone who has the ability to truly love themselves is able to set boundaries and create a way of communicating their needs in a way that is diplomatic, grounded, kind and reasonable. Having a strong sense of yourself, your values, beliefs, strengths and weaknesses is a good thing. Understanding the cravings and desires of your ego is a good thing as well. You just don’t want to over-identify with your ego’s often frivolous cravings and shallow desires such as attention, material attainments or praise for the hope of being viewed by others as superior, better than or even worthy. This is not self-love, this the ego’s desperate attempt to gain attention and love from others in a way that is not healthy or from a space of knowing yourself deeply. These attempts for external validation of being lovable or worthy can stem from fear that you are falling short in the opinions of others and need to over-compensate through an over-striving ego. Phew, that was a mouthful…I could go on and on about the ego. It is a challenging, dynamic and important topic, but right now I really want to get to the good stuff about self-love! When you are practicing self-love you are treating yourself with respect and care. Self-love is striving to grow into who you know you can be and truly are at your highest, strongest, healthiest version of yourself. Most importantly, self-love is never giving up on yourself. When you truly love yourself you are resilient, courageous and confident—because you love you! When you truly love yourself you don’t seek love from others, however you are completely open and unafraid to receive love from others. When you truly love yourself you believe that you are indeed lovable and worthy. Is this how you feel? If not, you are not alone. Many people at times feel inadequate, not good enough or not deserving of good things, like love, in their lives. When these negative beliefs are strong and overwhelming it can cause self-sabotage or relationship sabotage. The key to building and creating self-love is to know yourself fully and deeply and to actually like and accept who you truly are. To know and accept yourself means that you are not afraid of your shadow side (the not so great stuff about yourself that you fear others will figure out about you and then run fast and far) and that you actually embrace and accept the shadow parts of yourself as a part of the totality of who you are. This can directly have a positive impact on your ability to accept and embrace elements of others that you may find to be “unacceptable.” Light-bulb: this will help expand the unconditional love you are able to offer yourself to others as well! One way to practice building and creating self-love is self-reflection. There are many ways to reflect, including journaling, meditation and attending therapy. For today I will focus on journaling as it super accessible. Using a journal consistently will help you reflect and know yourself more deeply creating an opportunity to grow and build self-love. To begin, use prompts such as: “what are my strengths?” “what are my weaknesses?” “what do I like about myself?” “what would I like to improve about myself?” “what are my personal values?” “what do I struggle to accept within myself, why?” what do I struggle to accept about others, why?” When you start answering these questions and take time to review them, what stands out to you? Thank yourself for taking the time to reflect and grow in your ability to love yourself through the process of self-reflection. Another way to create self-love is to date yourself. When was the last time you did exactly what you wanted to do exactly when you wanted to do it? If it wasn’t pretty recent, chances are you are depending on others too much for your happiness. When you take yourself out on a date you get to choose everything you want! Do you want to go a particular restaurant? Then go there! Do you want to see a specific movie? Take yourself to it! Do you want to curl up with a good book and cup of tea? Do it! When you learn to befriend and love yourself, you are never alone. When you find yourself wanting something from someone else and they are not—in your opinion—providing it for you, give it to yourself! See how this feels to spend time, to get to know and care for yourself. Meet your own needs and be proud of the relationship you can cultivate with yourself. There is nothing ego-based about that! On this same line of thinking other ways to offer yourself self-love is to write yourself love notes, positive affirmations and positive messages. Remind yourself that you are worth time, effort, reflection and getting to know. Remind yourself what you like about yourself, what you accept about yourself and that you want to have a healthy, loving relationship with you. One last way to create more self-love is to change patterns of negative thinking that have led to not loving yourself unconditionally in the first place. This requires hard work, but it’s totally worth it. Examine your thoughts, beliefs and opinions you have about yourself. How do those make you feel about yourself? What kinds of words are running through your mind about yourself in the form of thoughts? How do those thoughts make you feel in your body? Is it pleasant? Are they kind? Are they negative, self-deprecating and harsh? Do your thoughts support being loving and kind towards yourself? If not, write them down and practice the powerful technique of Reframing. Reframing is taking your negative or unkind thoughts and putting them into a more neutral, reality based statement. For example, if your thought is, “I knew I’d fail at ___________” (which triggers feeling as though you are inadequate/not good enough/unlovable), try changing the thought to something such as, “Failure is an opportunity to grow, I will figure this out” or “I have failed in the past and survived and I will survive this time as well.” Note: this is not the power of positive thinking, (which I do recommend, just not for this process). This is reframing your thoughts so they are more aligned with what is real and what is true RIGHT NOW. This is allowing yourself to build trust in yourself that your mind will not continue to cause and perpetuate a harmful, conditional-love-based relationship with yourself. This all may seem like a lot. And while I wanted to write about it all from a happy-happy-happy place of self-love and acceptance since it’s Valentine’s Day and all, this is the reality. This is what you are faced with within your own mind on the regular. It’s time to take ownership over your mind, your thoughts, your beliefs and your actions. This includes how you treat yourself. If you want to be loved, love yourself! If you want to be treated well, treat yourself well! It all starts and it all ends with you—no one else can create self-love for you. While this may feel daunting and maybe even harsh, it’s powerful when you put it into practice! You can create the reality you desire not by seeking love but by creating love. Not by pouring out all of your love but by giving yourself love, refilling your own self-love cup. Remember, there is an infinite supply of love. You deserve to be loved. You deserve to love yourself. You deserve love. What will you do to grow your self-love today?